Continuing on in the spirit of Cleaning out the Cabinets, here is another recipe to use several of my pantry ingredients. 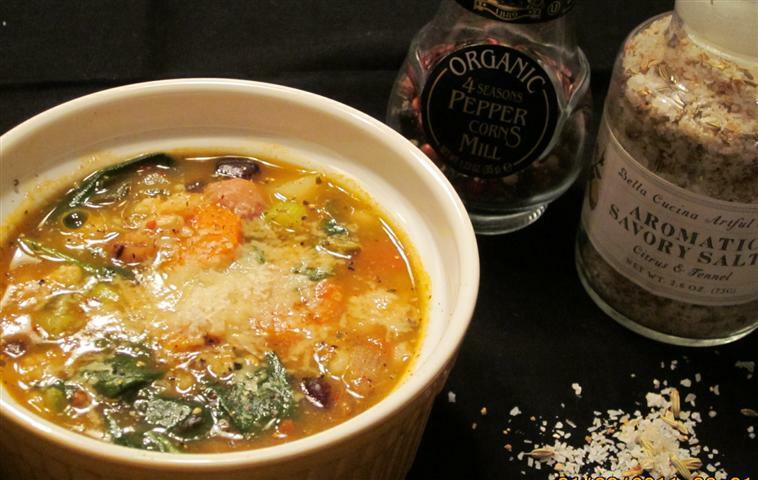 This is a delicious soup for a cold winter day (or ice storm as the case may be!). Pressure cook 2 whistles. After cooling, Keep half the beans in the freezer for the next soup! Heat oil, add mustard seeds, 4 shallots (all veggies mentioned should be chopped). Once they turn translucent add 3 cloves of garlic, 2 carrots, 2 red potatoes, 2 dried red chilies and 1 TBS Italian herb blend. Stir it around and saute for a few minutes. Then add 3 big leaves of swiss chard, 2 tomatoes, 2 c vegetable broth, cooked barley and any extra liquid, 1c cooked beans, 1c water, chili paste or hot sauce, 1 bay leaf, salt and bring to a boil. Cover and simmer until potatoes are done. Then add in 2c baby spinach, 2 spring onions and a handful of cilantro. To serve top it off with freshly ground black pepper, coarse sea salt, grated parmesan and/or nutritional yeast flakes. Whew, that’s a lot of healthy goodness! I was so lucky to receive a lovely gift basket in an exchange party before the holidays. I should’ve posted a pic before! It had some nice french milled soap, a soy based candle, hand cream, a small jar of “holiday” jam, lake champlain dark chocolate bar (used in the tiramisu), and the salt that you see in the picture above. The salt blend has dried lemon peels and fennel seeds and really adds a nice touch to the soup. I just discovered how nice fennel is in soup when I made the potato kale soup last year. If you don’t have this salt, you may want to add fennel seed to your soup. It adds a whole new dimension. I’m sending this(a tad bit late) to Hearth and Soul event, which already has over 80 entries, wow!